Burch Insulated Cooler Room Doors feature a wood jointed torsion frame to insure strength and long lasting performance. These engineered doors feature ample fiberglass insulation and an 18 gauge metal frame with a 22-gauge metal face, all powder coated for protection in harsh environments. 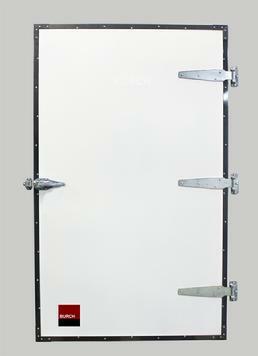 Each door includes heavy galvanized hinges, door handle, striker, safety pushrod and hex mounting lag screws. Standard and custom sizes available in Left or Right hand. Note: With Left Hand Doors, the hinges are on the left and the door handle is on the right. With Right Hand Doors, the hinges are on the right and the door handle is on the left. Door construction is full 2" x 4" wood frame with 2" x 6" latch and hinge supports. All joints are glued and all fastening counter-bored and plugged. Fiberglass Insulation standard in all doors. Styrofoam filled doors available at extra cost. All Sizes Reflect Dimensions of Insulated Door Portion. Add to door opening for wiper gasket 1 1/2" in Height. Add 1/2" for width. The Door pictured is a LEFT HAND HINGED DOOR. We build Right and Left as standard. Please specify. Frequently Ordered Sizes of Reach-In and Walk-in Doors.